Invigorating and inventive Alpine cuisine presented in a sleek, modern setting. : German cooking brings to mind sausages and weiner schnitzel, washed down with a tankard of beer. But Gruner, which means "green" in German, expands these traditional limits. The food isn’t strictly German, but rather "Alpine," blending culinary influences of Austria, Germany, France and Switzerland. The kitchen’s dedication to greens is displayed in its namesake salad, a brimming bowl of lettuces, chickweed, carrots, fennel, beets and more, under a shower of sunflower seeds and pretzel croutons. Its competition is an inspired green goddess variation, while another salad combines green beans, blackberries, goat cheese and hazelnuts. The famous namesake burger (available only in the bar) boasts quality beef topped with house-cured bacon, Fontina or cheddar, pickles, aïoli and arugula. Other options include cider-braised chicken and grilled rainbow trout in a horseradish beurre blanc. And yes, traditionalists will find homemade bratwurst accompanied by tangy sauerkraut. Desserts include the "Berliners," cinnamon-sugared donuts served with seasonally varying toppings such as caramel and chocolate ganache or a blueberry compote. For libations, peruse the intriguing Central European-dominated wine list, or consider one of the unusual imported beers. There are also creative cocktails made with Slivovitz or house-made herbal liqueurs. 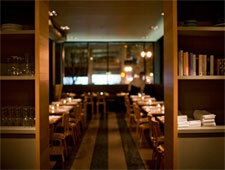 An adjoining bar, a more casual spot called Kask, offers simpler food in the same European spirit.